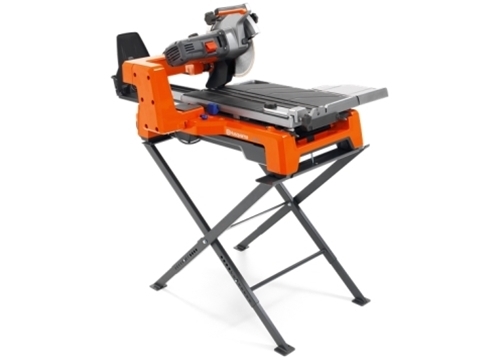 TS 60 | The Husqvarna TS 60 tile saw is a robust saw with a refined cart and rail system for perfectly straight cuts. The TS 60 is equipped with a patented water and slurry system called the Jet Stream. This makes it possible to direct the water to either the cart trench or through the blade guard. By having the blade pick up water from the trench instead of spraying it onto the blade, you get little or no mess and thereby a clean work place. This includes an efficient recycling system that cleans water for reuse. Elgard warns you of an approaching motor overload, and Electronic Softstart allows starting with normal, slow acting fuses.